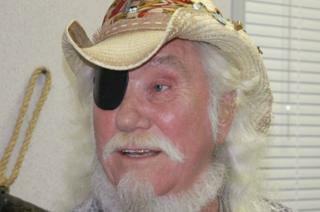 Ray Sawyer - the eye-patch wearing singer with Dr Hook & the Medicine Show in the 1970s - has died, aged 81. His wife Linda said Sawyer died "peacefully in his sleep", adding that her "heart is broken." The band is best known for the song When You're in Love with a Beautiful Woman, which was a number one hit in the UK in 1979. Despite not being the lead singer, his eye patch - and cowboy hat - meant he was the most easily recognised. But Sawyer, who was born in Chickasaw, Alabama, in 1937, did take lead vocals on one early hit, 1972's Cover of the Rolling Stone. In the song's lyrics, he sang: "The biggest thrill we've never known is the thrill that'll getcha when you get your picture on the cover of the Rolling Stone." Dr Hook did eventually appear - in caricature - on the front of the famous magazine in 1973. "Here was this little band from Alabama standing on the corner saying, 'Hey, put us on the cover', and it worked," he later said, according to Ultimate Classic Rock. "It was a dream come true." The band's other hits included Sylvia's Mother. Dennis Locorriere, who was one of the founders of Dr Hook with Sawyer, said in a statement to Rolling Stone magazine that though they had not spoken for years "it does not erase the fact that we were once close friends and shared an important time in both our lives". "Deep condolences go out to his family at what must be a difficult time." Fans posted tributes to Sawyer on social media.